You really need a nice old bicycle in these photos to make them complete. It’s a fun outfit. You are so inspiring! All of your projects I’ve seen are made so perfectly. You have an amazing gift. Thank you for sharing and inspiring me, and lots of others. I can’t wait to see what your next creation will be. You and the costume look stunning. A few of the photos could have been more effectively framed. You are so right about the shoes! WOW! Despite the fact that you aren’t happy with the pictures, the outfit and you really are gorgeous and amazing! Great job! You always have such awesome creations! wow!! this is amazing! such a perfect costume! the pose, makeup and style is great too! i am speechless!!! Most bikers I know are always happy to show off their bikes – no matter what you’re wearing. Great job, this costume is amazing. 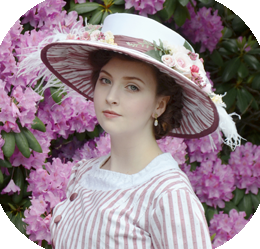 It reminds me of the costume Anne Shirley wears in the very beginning of the old PBS miniseries “Anne of Avonlea” – and that’s a good thing. That costume is simply stunning and you completely rock it!